Greetings to all of you, my friends, all of you who are attending the General Assembly 2014. Greetings from Jerusalem – the eternal and united capital of the Jewish people. Michael are you speaking or am I speaking? Thank you, Michael, and thank you all. I want to thank my friend of many decades, Michael Siegal, for the kind introduction, and I want to thank you, Michael, for the exemplary work you’re doing as Chairman of the Board of the Jewish Federations. and the hundreds of leaders and professionals who are there tonight, for the terrific job you do to strengthen the Jewish communities of North America and to strengthen support for Israel. Your communities have stood resolutely by our side as Israel has defended itself time and again against enemies bent on our destruction, including during this past summer in Operation Protective Edge. You led solidarity missions; you raised money to help those in need; and you held rallies in support for Israel. And as our soldiers defended Israel on the battlefield, you helped defend Israel in another battlefield – in the court of public opinion. And you did that by doing something very simple – you just told the truth. You told the truth about Israel’s just battle against Hamas terrorists. I want to say two words to you: Thank you. Thank you for standing up for Israel. Thank you for standing up for the truth. I also want to recognize Jewish Agency Chairman Natan Sharansky, a true hero of the Jewish people. Natan, like you, works day and night to strengthen the Jewish future. And finally, I want to recognize Ron Dermer, Israel’s exceptionally talented ambassador in Washington. Thank you, Ron, for all you are doing to strengthen the bonds between Israel and the United States and between Israelis and Americans – American Jews and American non-Jews. And by the way, Ron, you can tell Vice President Biden that I know we’re still buddies. We’ll always be buddies. The Vice President said yesterday that we don’t always agree. That’s true. But we definitely agree that Israel has no greater friend and ally than the United States, and that the United States has no greater friend and ally than the State of Israel. I deeply appreciate the unique and special friendship between Israel and the United States of America, as well as the great friendship between Israel and the state of Canada. It’s important to have friends like the United States and Canada because, it’s important for any country to have such alliances, but especially for a country like Israel that faces many challenges unlike any other nation on Earth. But none of these challenges is more important than the threat posed by Iran’s nuclear ambitions. Iran is openly committed to Israel’s destruction. 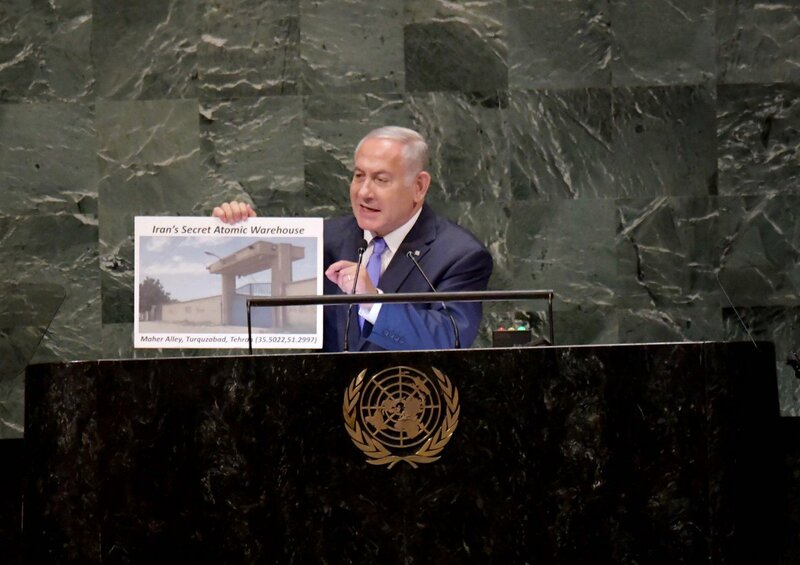 And even as Iran negotiates a nuclear deal with the leading powers in the international community, its Supreme Leader, Ayatollah Khamenei, brazenly calls for Israel’s annihilation. These are not my words, these are his words: Israel’s annihilation. He just did it again three days ago on his Twitter account. That’s apparently the Iranian regime’s idea of modernity – tweeting about the annihilation of Israel. But I’m afraid these aren’t mere words. These aren’t mere words; they’re not just statements thrown out in the air, which is harmful enough. The regime in Iran’s wild rhetoric is also backed by murderous action. Iran arms, trains, finances the Palestinian terrorist groups Hamas and Islamic Jihad. It has supplied them, and its main terrorist proxy, Hezbollah, with tens of thousands of rockets to fire on Israeli citizens. Iran perpetrates murder and mayhem throughout the Middle East – in Syria, in Iraq, in Lebanon, in Gaza, in Yemen and elsewhere. It has spread a reign of terror across five continents – from Bangkok to Burgas, and even an attempt in Washington, DC. Iran’s savagery abroad is also matched by its brutality at home. The ayatollah regime executes political opponents, religious and ethnic minorities, gays, feminists and journalists. And executions have increased, not decreased, under the supposedly moderate Rouhani regime. It’s obvious that Iran wants to remove the sanctions that have had such a devastating impact on its economy. But it should be equally obvious that Iran is not prepared to dismantle its nuclear weapons program in return. Unfortunately, instead of holding firm and demanding that Iran dismantle its program, the international community is reportedly, and I hope these reports do not prove to be true, but the international community is reportedly willing to leave Iran’s nuclear program largely intact. They hope to rely on intelligence and inspectors to prevent Iran from developing nuclear weapons. I believe this would be a bad deal and a huge mistake. We must recognize the limitations of our own intelligence gathering capabilities. Remember – for years, both Israel’s intelligence and US intelligence failed to discover Iran’s secret enrichment facilities at Natanz and Qom. And given that record, there is no reason to believe that our intelligence facilities will be perfect in the future. As for inspectors, they weren’t able to stop North Korea from getting the bomb. And if the ten year run-around that Iran has given the International Atomic Energy Agency is any indication, inspectors won’t stop Iran from getting the bomb either. The IAEA itself has reported just last week that Iran continues to conceal the most suspicious aspects of its nuclear program from the international inspectors that are already in Iran. Some people have suggested that Iran can help America solve the problems of the Middle East. But Iran is not part of the solution. It’s a huge part of the problem. The Islamic State of Iran is not a partner of America. It’s an enemy of America. And it should be treated as an enemy – by keeping tough sanctions on the regime; by making clear that the international community is determined to do whatever it takes to prevent Iran from breaking out or sneaking out to get the bomb. See, the worst thing that can happen now is for the international community to agree to a deal that leaves Iran as a threshold nuclear power and removes the sanctions. That would be a disaster of historic proportions. It would embolden all of Iran’s terrorist proxies throughout the region; it would trigger a nuclear arms race between Sunnis and Shi’ites that would endanger the entire planet. And it would pose, needless to say, a grave danger to the State of Israel. But the alternative to a bad deal is not war. It means giving existing sanctions and even stronger sanctions more time to work to achieve the goal of fully dismantling Iran’s military nuclear capabilities. To remove sanctions before that goal is reached is to remove any hope of a genuine diplomatic solution. That is why avoiding a bad deal and maintaining strong pressure on Iran should be the policy of all responsible governments. So too, all responsible governments should help President Obama in his effort to degrade and defeat ISIS. But as I said to the United Nations a few months ago, to defeat ISIS and allow Iran to be a threshold nuclear power would be to win the battle and lose the war. The greatest threat facing our world is to have the forces of militant Islam get the bomb. That must never be allowed to happen, for Israel’s sake, for the peace in the Middle East, for the peace and security of the entire world. As we work to prevent the ultimate danger of a nuclear-armed Iran, we must also act forcefully to confront Palestinian terrorism and incitement. In recent weeks, we have seen a dramatic rise in terrorist attacks against Jews across the country, including here in Jerusalem. These attacks have been accompanied by a systemic campaign of incitement, including libels about Israel trying to change the status quo on the Temple Mount and even wild allegations that we are planning to destroy Muslim holy sites. These are false accusations. They’re absolute fabrications. Israel is fully committed to the status quo. Last week, I spoke to King Abdullah of Jordan, and I reiterated Israel’s commitment to maintain the religious status quo on the Temple Mount. I will continue to make every effort to restore calm, to restore quiet and security, so that all may enjoy the religious freedom guaranteed by Israeli law. But I regret to say that the Palestinian Authority, which should also be working to calm tensions, has joined Hamas and other radical Islamists in fanning the flames. See, this – the Temple Mount, the holiest place in Judaism, where Jews have visited peacefully for years – President Abbas says we should not set foot there. That’s changing the status quo. President Abbas publicly praised the Islamic Jihad terrorist who tried to murder Rabbi Yehuda Glick, declaring that the would-be assassin would, and here’s his quote: “would go to heaven as a martyr defending the rights of our people and its holy places.” That’s the end of the quote. And just today President Abbas accused Jews of “contaminating,” his word – contaminating the Temple Mount. Once again, this incitement to violence is coupled with revisionist history intended to delegitimize the Jewish people and the Jewish state. The official Facebook page of Fatah, just turn it on, you’ll see it, you have to Google this to believe this. The official Facebook page of Fatah denies that the Jewish people have any connection to the Temple Mount or that there was ever a Temple Mount at all – a temple on the Temple Mount. Jerusalem, the ancient City of David, like the Land of Israel, is simply erased by the Palestinians from their history books. Unfortunately, the international community does not hold the Palestinians responsible for this sort of incitement and denial of history, and I think that’s tragic, because these distortions and this incitement are so corrosive to the effort to reach a genuine peace. Rather than help advance peace, many in the international community are setting back the cause of peace by convincing Palestinians that they can have a state without making peace with Israel. Recognizing a Palestinian state without demanding an end to the Palestinian Authority’s pact with Hamas, an internationally recognized terrorist organization is absurd. Recognizing a Palestinian nation-state without demanding that the Palestinians recognize the nation-state of the Jewish people is unjust. Recognizing a Palestinian state without demanding an end to incitement in official Palestinian media and schools is reckless. And recognizing a Palestinian state without demanding robust security arrangements to enable Israel to protect itself and the peace, that is dangerous. If the issue of Palestinian statehood is brought before the UN Security Council outside the context of a peace agreement with Israel, this should be flatly rejected. If any one-sided anti-Israel resolution is brought before that council, it should be vigorously opposed. The Israeli-Palestinian conflict will not be solved by exploiting the automatic anti-Israel majorities in the UN bodies. You can pass anything there. But that is not the way to achieve peace. The only way to peace is through direct negotiations that address all the core issues. Israel is ready for these negotiations; Israel is ready for peace; I am ready for peace. But it must be a genuine peace, a durable peace, and for that, we must have a Palestinian partner who is committed to forging such a genuine peace – a partner who is prepared to confront terrorism and end incitement; a partner who is prepared to recognize the nation-state of the Jewish people; a partner who is prepared to address Israel’s legitimate security concerns seriously; a partner who wants a Palestinian state not to continue the conflict with Israel, but to end it once and for all. There are many countries in the region today who do want to put the conflict behind us. I think that offers hope. There are leading Sunni Arab states that are re-evaluating their traditional hostility towards Israel. They increasingly understand that the real threat to them doesn’t come from Israel. It comes from militant Sunni radicals like ISIS and from a nuclear-armed Iran. And I believe that cooperation with these states – that are more ready to work for peace and security with Israel than ever before – I believe that cooperation with them can help open the door to peace with the Palestinians, and I believe this is possible. But for that, we need the international community to stand by Israel, to demand from the Palestinians to stop incitement and to demand from them to go for peace. For 66 years, the Jewish communities of North America have been dedicated partners in building the State of Israel. You have helped us transform Israel into a global technological powerhouse, a wonder of medicine and science and innovation, a vibrant and dynamic democracy. You have stood by Israel’s side as we forged historic peace agreements with Egypt and Jordan, and as we have worked to advance peace with the Palestinians. And just as you have stood with Israel, Israel stands with you in confronting anti-Semitism; in strengthening Jewish identity; in working to ensure that the next generation of Jews remains just as committed to our remarkable partnership; and in ensuring that all Jews around the world know that they will always have a home in Israel. And we have one destiny. Thank you for standing by Israel, and good bye from Jerusalem.